Secure property and evidence storage is crucial for police and law enforcement facilities. Improper storage could lead to property damage, theft, or missing items. These evidence lockers are designed specifically for law enforcement applications with a durable and vented design to keep stored items properly secured. Evidence lockers are available to buy in cabinet-only configurations (no shelves) or with three adjustable shelves. If you require more or fewer than 3 shelving levels, we suggest purchasing the cabinet-only option and additional shelves to add on later. 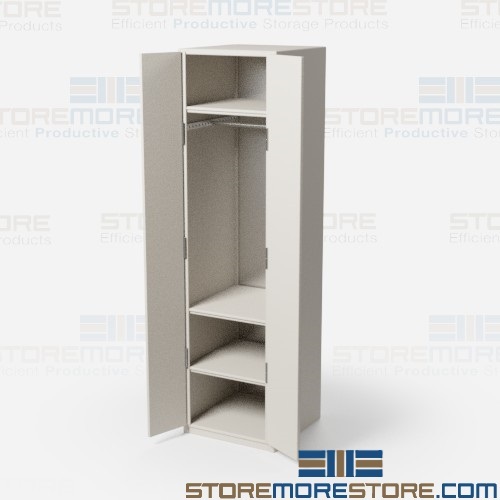 You can adjust each shelving level in 1″ increments for storing multiple types of items in one cabinet. Its perforated vented doors (single or double) also allow air to flow through the cabinet, which keeps items dry and prevents the buildup of mold, dust, or odors. 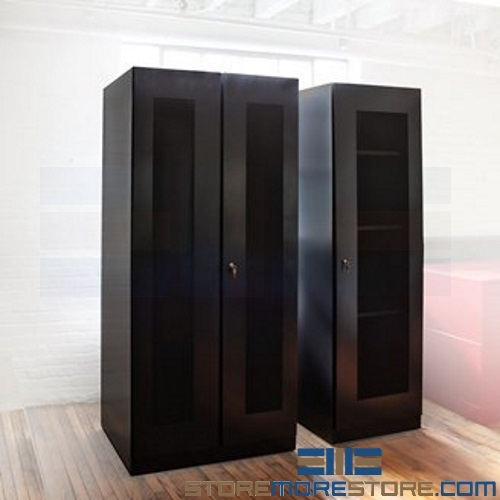 These doors also include four tamper-proof hinges that are inaccessible from the outside of the cabinet for stronger security and theft prevention. 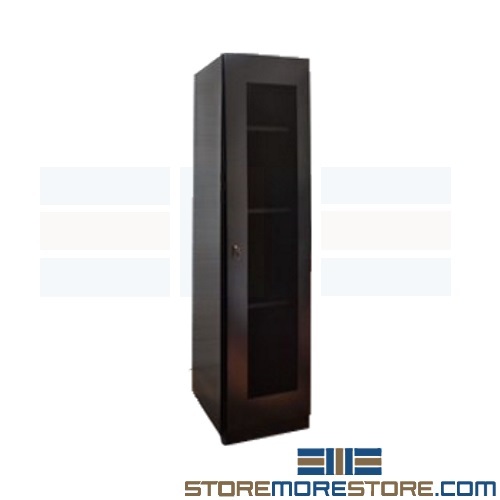 You can choose from evidence lockers with widths of 24″ or 36″ depending on the size of your application (all cabinets are 80″ in height). The all-welded evidence lockers ship fully assembled and ready to set in place. Lastly, the evidence lockers also have two 3″ pop-outs for power cords and electronics. Each shelf holds 50 lbs. Police evidence lockers are available to buy online and ship within 10-15 business days. Free dock-to-dock shipping included. If you need any assistance or just want some help picking the right solution for you, please call us at 1-855-786-7667. In law enforcement and military operations, every second counts. Storing bulky gear quickly eats up valuable space, making your storage area disorganized and stressful to navigate. In an emergency situation, officers are wasting time trying to retrieve their gear instead of being where they’re needed. Special ops SWAT gear lockers are designed for storing tactical equipment efficiently and in less space so officers can find equipment quickly. The special ops SWAT gear lockers include a variety of options so you can tailor your storage area to officer needs. A combination of coat hangers and adjustable shelving allows officers to store their gear in one convenient area. The lockers are great for storing multiple vests, pairs of boots, and gear bags. Units available in widths of 24″, 30″, 36″, 42″, and 48″. All units are 7’4″ high and 2′ deep. Shelves are 22-gauge steel and adjustable on 1.5″ centers. Shelving reinforcements included (one reinforcement for 24″, 30″, and 36″ wide shelves; two reinforcements for 42″ and 48″ wide shelves). Garment rods are 1.5″ in diameter and adjustable on 1.5″ centers. 2.75″ high bottom kick plates prevent items from rolling under the shelves. Units include two-piece closed back panels, which add .375″ to the overall depth. Optional hinged doors available with key locks or keyless electronic locks. Powder-coated, scratch and corrosion-resistant finish in a variety of colors. Tool free assembly and easy installation. Most components snap together with a rubber mallet hammer. Special ops SWAT gear lockers are available to buy online. For further assistance, call us at 1-855-786-7667 or send us a message to speak to one of our experts.